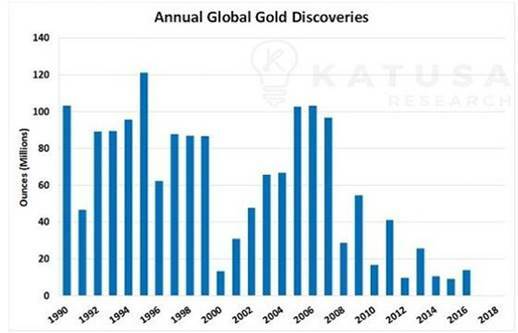 By David Smith: Going forward, there are – and will continue to be – three primary drivers of global physical gold (and silver) demand. However, as we move into 2019, and for possibly the next 5-10 years, all three will be in play. They will operate synergistically to consistently motivate increased precious metals' buying around the globe. This will happen, even as meeting that demand with sufficient new supply becomes problematic. The term "synergistic" is used here on purpose. By definition, it relates to "the interaction or cooperation of two or more organizations, substances or other agents to produce a combined effect greater than the sum of their separate effects." People buy gold (and silver) as insurance, as an easily saleable for cash when needed option, and as a last ditch "get out of Dodge" ticket when the local currency has been "burned" due to government mismanagement and corruption. Ask Vietnamese in the 1970's or Zimbabweans, now in their second currency-destroying hyperinflation in recent memory. Ask Argentines facing their 9th currency-extinction event in modern history, or Venezuelans today. 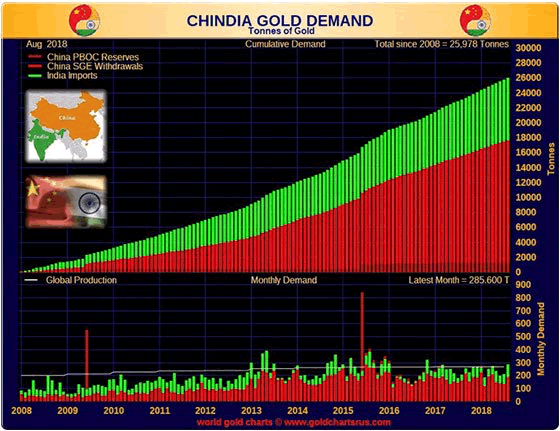 Love: The Chinese New Year celebrations are coming into view... Gold demand from China and India (Chindia) has been consistently higher for the last decade – with no signs of tapering. Fed policymakers will print, literally and digitally, "as much as it takes" to keep this from happening. They want and need inflation to keep their game going as long as possible. Not to mention that the government's massive deficits get paid off in worth-less money. Politicians can continue spending paper promises, get re-elected, and reward their political allies. When a financial crisis is related to the private sector, it generally takes a deflationary form. When it relates to the government, it generally takes an inflationary form. The next super-crisis in the West is vastly more likely to be a government crisis, not a private sector crisis, and the place that crisis is most likely to take place in is... America. 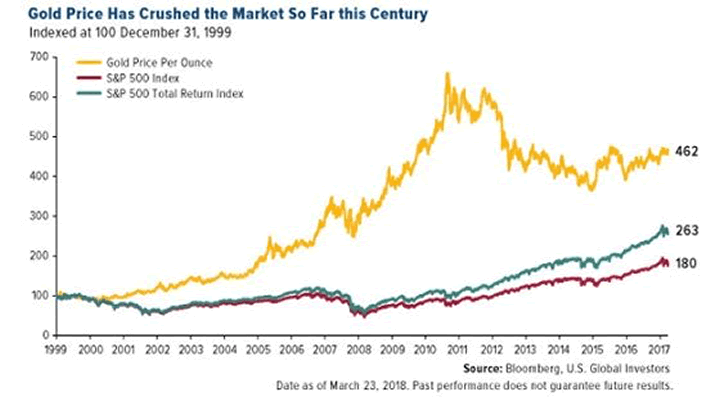 Over 20 years, Gold has outpaced stocks... and inflation. In 2001, at the tail end of a 20-year silver bear market, Doug Casey said: At the top, people don’t look at fundamentals because they think they’re no longer relevant... At the bottom, they’re not looking because they just don’t care. What have the global 'financial wizards' learned since 2008? In 2008, global debt totals were in the area of $170 trillion, to the tune of 275% of the world's gross domestic product (GDP). Today those figures are above $250 trillion and well over 300% of GDP. Look at how little the world's financial wizards seemed to have learned from the crises which literally came within hours of taking the entire global financial system down with it. So if you haven't taken this opportunity into declining prices to either establish a position in physical gold and silver, or have yet to "top off" your holdings, consider answering the question Dirty Harry often posed to his opponents, "Do you feel lucky today?" © 2018 Disclaimer: The above is a matter of opinion provided for general information purposes only and is not intended as investment advice. Information and analysis above are derived from sources and utilising methods believed to be reliable, but we cannot accept responsibility for any losses you may incur as a result of this analysis. Individuals should consult with their personal financial advisors.